Sunrider Mango Candy Archives - Sunrider More Energy, Laser-Beam Thinking, Vibrant Health! Sunrider Smart Gummy Mango are HEALTHY gummies. 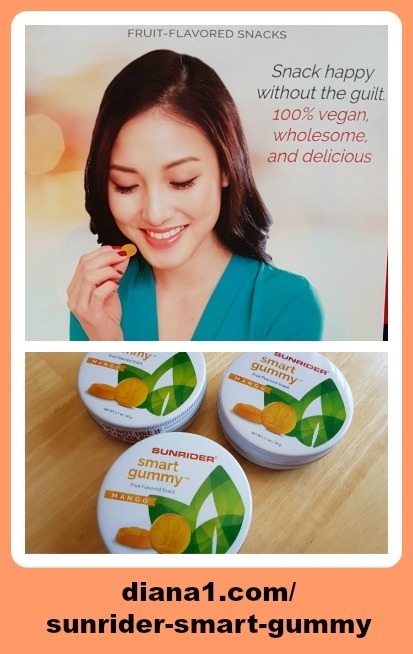 Sunrider Smart Gummy Mango gummy candies contain natural fruit flavors, lots of soluble and insoluble fiber, and vitamins, including Vitamin B12 and Vitamin E…. with NO added sugar or gelatin. Guess what? Dr. Tei Fu Chen (Founder of Sunrider) has 16 Grandchildren now, and he wanted to be sure they had healthy treats!! The problem with these is that they are SO delicious you might eat a whole tin …and that’s what happened to many Sunriders who ordered them at the Sunrider Grand Convention 2017 in California! New Sunrider product – Huge Hit with everyone! Mango Smart Gummy – a Healthy and delicious candy! Natural ingredients…. New Sunrider product – Fruit Flavored Snack – Huge Hit with everyone! Mango Smart Gummy – a Healthy and delicious candy! Natural ingredients. Nothing artificial. Real fruit and vegetable juice. High in Fiber, Vitamin B12, D2 and E.
Available at Sunrider Convention 2017 – and will be available in Canada and USA soon, I think. Sunrider Smart Gummy High in Fiber! Oh – and be sure to drink lots of water or Fortune Delight if you are eating lots of these Sunrider Smart Gummy candies!! I know 2 or 3 Sunriders who ate half the tin at one time. They had to use the bathroom a lot, because these wonderful delicious gummies are high in Fiber! them a healthy everyday treat. Smart Gummy Sunrider — carrying and sharing these delicious healthy treats is easy with the handy container. Our bodies are designed to recognize foods, not chemicals. Additives, preservatives, and synthetic vitamins and minerals are all inferior to whole foods. Sunrider Smart Gummy™ is made with natural ingredients, including real fruit and naturally derived vitamins. Free of artificial sweeteners, colors, or preservatives, Smart Gummy™ is a healthy snack that you can feel good about eating. This sweet-tasting plant belongs to the chrysanthemum family and contains natural antioxidants that are further enhanced through Sunrider’s concentration process. This form of vitamin E has antioxidant effects that can help protect against harmful toxins in the environment and help remove free radicals from the body. Q: Do Smart Gummy™ snacks contain gelatin? A: No, these are gelatin-free gummies. Instead of gelatin (which is derived from animals), our Smart Gummy™ snacks are made with a soft pectin base derived from fruit. The pectin is 100% plant based, and because none of the other ingredients contains animal derivatives, Smart Gummy™ is suitable for vegans/vegetarians. Q: Where does the coloring for Smart Gummy™ come from? A: We named our gummy treats “smart” for a reason. They’re made with natural ingredients and don’t contain anything artificial, including colors. The Smart Gummy™ color comes from real fruit and vegetable juice of the highest quality.